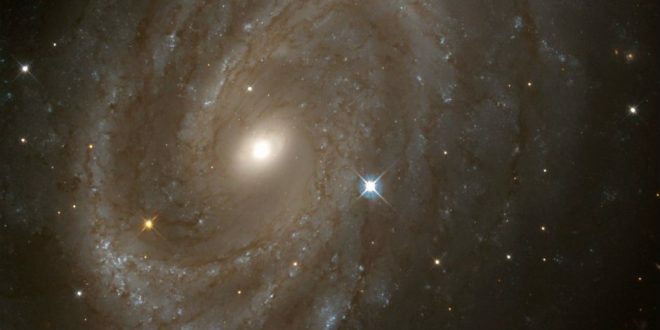 Astronomers have confirmed the age of a spiral galaxy to be 11 billion years old, making it the oldest ever discovered. The most ancient spiral galaxy discovered to date is revealing its secrets to a team of astronomers at Swinburne University of Technology and The Australian National University (ANU), part of the Australian Research Council Centre of Excellence in All Sky Astrophysics in 3D (ASTRO 3D). The researchers used a powerful technique that combines gravitational lensing with the cutting-edge instrument the Near-infrared Integral Field Spectrograph (NIFS) on the Gemini North telescope in Hawai‘i to verify the vintage and spiral nature of this galaxy. NIFS is Australia’s first Gemini instrument that was designed and built by the late Peter McGregor at The ANU. Gravitational lenses are Nature’s largest telescopes, created by massive clusters composed of thousands of galaxies and dark matter. The cluster bends and magnifies the light of galaxies behind it in a manner similar to an ordinary lens, but on a much larger scale. “This technique allows us to study ancient galaxies in high resolution with unprecedented detail,” says Swinburne astronomer Dr Tiantian Yuan, who led the research team. Co-author, Princeton University’s Dr Renyue Cen, says: “Studying ancient spirals like A1689B11 is a key to unlocking the mystery of how and when the Hubble sequence emerges.